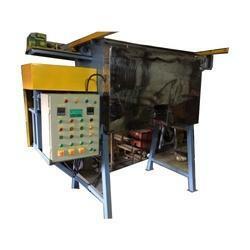 Manufacturer of a wide range of products which include makhana roaster machine and electrical roaster machine. The Makhana Roaster Machine also is known as Fox Seed Roasters are used for roasting types of light weight seed products like Fox Seeds, like Coriander, Fenugreek seeds, etc. The Fox seed Roasters are batch type machines and are supplied as a complete package consisting of process chamber, heating system, Drive unit, & pre wired control panel, and special care is taken to minimize the breaking of fox seeds during the roasting process. heating is achieved through Electrically operated oil immersed heaters, and the heating temperature is controlled through digital temperature controller. The heating temperature can be achieved up to 250 Deg. C.
The Constant temperature with constant time gives Consistency in Quality. The Flex Seed Roaster machine utilizes simple contra flow mechanism, which gives best roasting / blending results as every particle equally comes in contact with heating jacket and gets equally roasted. The Flex Seed Roasters are available in complete Stainless Steel or Contact parts in Stainless Steel type constructions and in Higher size machines, can also be fabricated as per customer requirements. 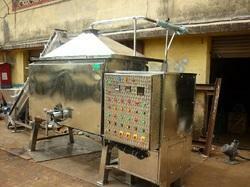 Usage: Roasting various types of Seeds, Pulses, Grains, Flours, Granules, Semi paste, and Gravy type products. Electrical Roaster Machine offered can be made available by us in different finish specifications and comes with the support of heating element and motor under the pot to assure of reliable and consistent performance. Further, the motors can be provided in different functional capacities to pick from. Support of meter temperature controller for easy controlling of temperature.